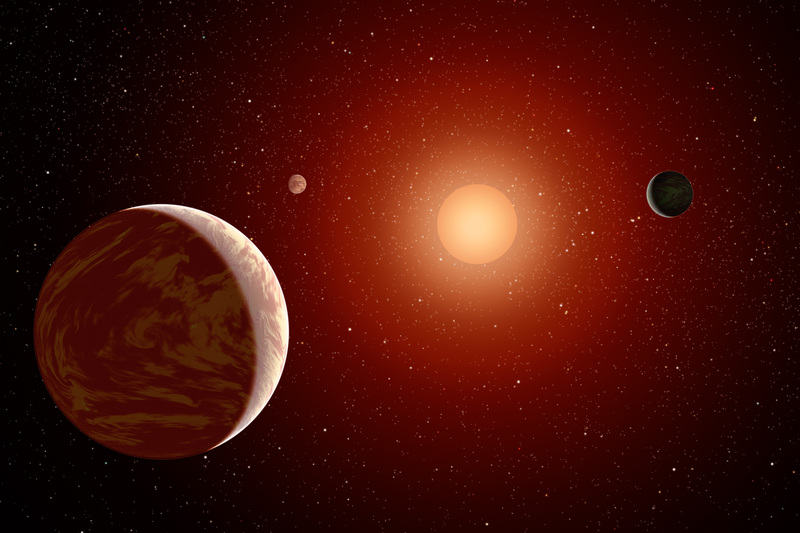 Exoplanets are easier to see directly when their star is a dim, red dwarf. Strange but true: When it comes to finding new extra-solar planets, or exoplanets, stars can be an incredible nuisance. It’s a matter of luminosity. Stars are bright, but their planets are not. Indeed, when an astronomer peers across light years to find a distant Earth-like world, what he often finds instead is an annoying glare. The light of the star itself makes the star's dim planetary system nearly impossible to see. Talk about frustration! How would you like to be an astronomer who's constantly vexed by stars? Fortunately, there may be a solution. It comes from NASA's Galaxy Evolution Explorer, an ultraviolet space telescope orbiting Earth since 2003. In a new study, researchers say the Galaxy Evolution Explorer is able to pinpoint dim stars that might not badly outshine their own planets. Young red dwarfs produce a telltale glow in the ultraviolet part of the electromagnetic spectrum that Galaxy Evolution Explorer can sense. Because dwarf stars are so numerous–as a class, they account for more than two-thirds of the stars in the galaxy–astronomers could reap a rich bounty of targets. In many ways, these stars represent a best-case scenario for planet hunting. They are close and in clear lines-of-sight, which generally makes viewing easier. Their low mass means they are dimmer than heavier stars, so their light is less likely to mask the feeble light of a planet. And because they are young, their planets are freshly formed, and thus warmer and brighter than older planetary bodies. Astronomers know of more than five hundred distant planets, but very few have actually been seen. Many exoplanets are detected indirectly by means of their “wobbles”–the gravitational tugs they exert on their central stars. Some are found when they transit the parent star, momentarily dimming the glare, but not dimming it enough to reveal the planet itself. And it just might make astronomers feel a little better about the stars. describes many of the other discoveries and accomplishments of this mission. And for kids, how do astronomers know how far away a star or galaxy is? Play “How Old do I Look” on The Space Place at http://spaceplace.nasa.gov/whats-older and find out!